[PRESS RELEASE 2017-12-22] Researchers at Karolinska Institutet have managed to sequence the giant genome of a salamander, the Iberian ribbed newt, which is a full six times greater than the human genome. Amongst the early findings is a family of genes that can provide clues to the unique ability of salamanders to rebuild complex tissue, even body parts. The study is published in Nature Communications. This is the first time that an entire newt genome has been sequenced, an achievement that can give rise to new discoveries on the amphibian’s ability to recreate brain neurons as well as entire body parts. Amongst the first findings are a multitude of copies of a certain microRNA group, which in mammals is mainly found in embryonic stem cells, but also in tumour cells. Even though the abundance of stem cell microRNA genes is quite surprising, it alone cannot explain how salamanders regenerate so well. Professor Simon predicts that the explanation lies in a combination of genes unique to salamanders and how other more common genes orchestrate and control the actual regeneration process. 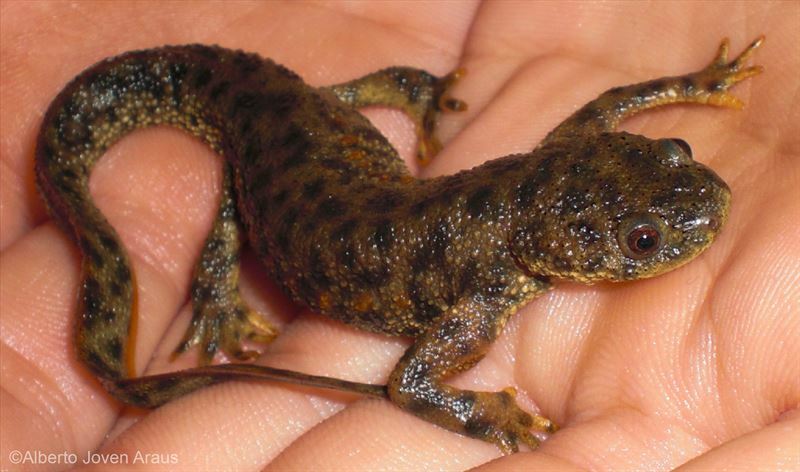 One of the reasons why salamander genomes have not been sequenced before is its sheer size – six times bigger than the human genome in the case of the Iberian newt, which has posed an enormous technical and methodological challenge. The group at Karolinska Institutet is now engaging with other researchers to discover what can be learned from the newt genome and test new hypotheses through systematic comparisons with mammals. The sequencing project was conducted in collaboration with SciLifeLab and Uppsala University and was largely financed with grants from the Swedish Research Council, the National Institutes of Health (USA), the European Research Council, the Swedish Cancer Society and the Wenner-Gren Foundation. Publication: “Reading and editing the Pleurodeles waltl genome reveals novel features of tetrapod regeneration”, Ahmed Elewa, Heng Wang, Carlos Talavera-López, Alberto Joven, Gonçalo Brito, Anoop Kumar, L Shahul Hameed, May Penrad-Mobayed, Zeyu Yao, Neda Zamani, Yamen Abbas, Ilgar Abdullayev, Rickard Sandberg, Manfred Grabherr, Björn Andersson, András Simon. Nature Communications, online 22 December 2017, doi: 10.1038/s41467-017-01964-9.